Posted on Jun 1, 2012 by Laura Franz. You’re online, and you stum­ble on a site using a great web font. It makes your heart sing. And you want to know what it is. Enter the What­Font tool cre­ated by Chengyin Liu. It’s a quick and easy way to find out what web font is in use. Roll over the type, and the font-family name pops up. 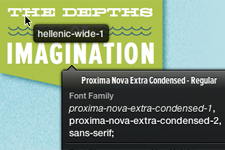 Click on the type, and you’ll even get type­set­ting infor­ma­tion (font-size, line-height, and color). This is par­tic­u­larly help­ful when you find a site where the text is both beau­ti­ful and easy to read. 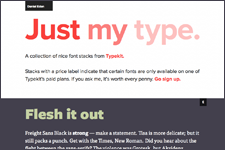 Good web type isn’t just about using a good web font. The book­marklet claims to have full sup­port on Fire­fox 3.6+, Chrome 9+, Safari 4+, Inter­net Explorer 9; and lim­ited sup­port on Inter­net Explorer 8.